Exhibit #1. Global Land-Ocean Temperature Index. 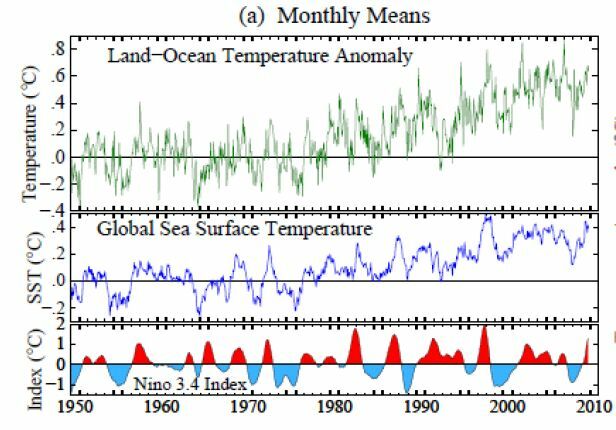 Source: Goddard Institute for Space Studies, via James Hansen: “The Temperature of Science.” Read it here. Exhibit #2. Hemispheric Temperature Change. 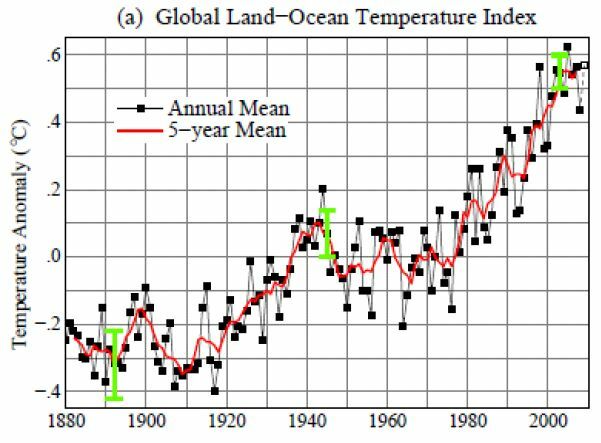 Source: Goddard Institute for Space Studies, via James Hansen: “The Temperature of Science.” Read it here. Exhibit #3. 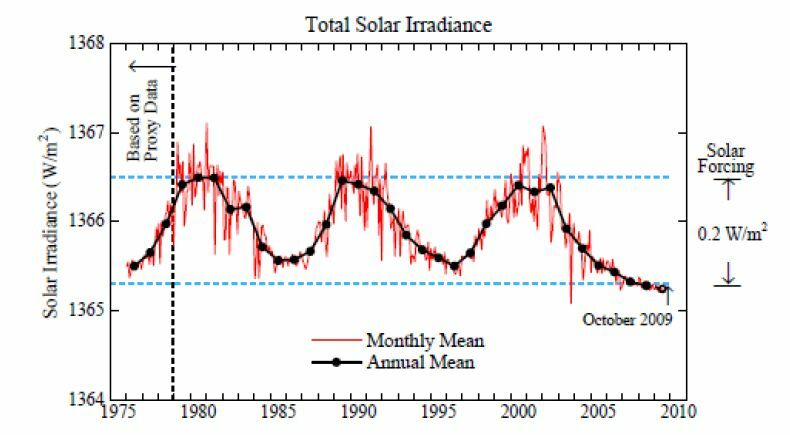 Total Solar Irradiance. Source: James Hansen: “The Temperature of Science.” Read it here. Exhibit #4. Cherry-picking data. Source: (Video) Creepy at the EPA. (View it here.) This chart illustrates how data can be “cherry-picked” to show almost anything one wants to show. When viewing temperature trends, it is important to look at data over long stretches of time, up to the present. Exhibit #5. 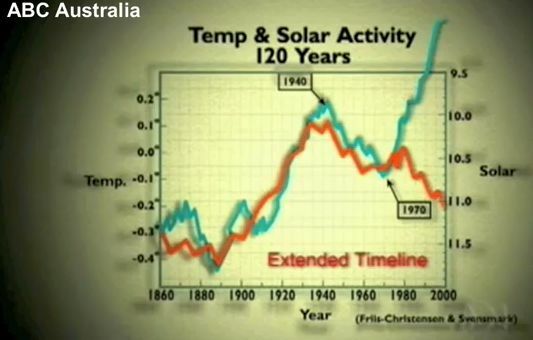 Temperature and Solar Activity. Source: (Video) Creepy at the EPA. (View it here.) 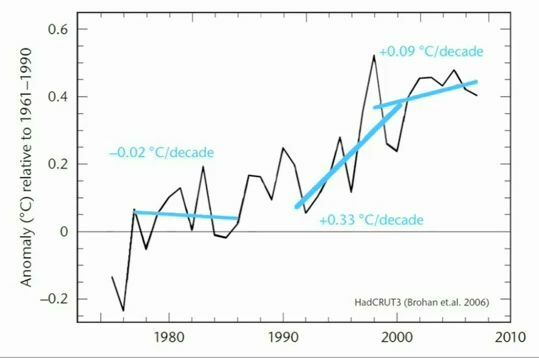 This chart provides evidence that global temperatures have become uncoupled from solar activity. Exhibit #6. 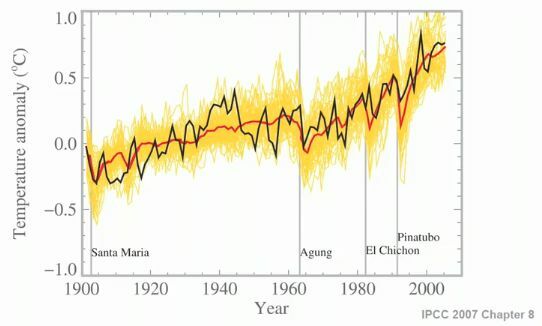 El Nino and La Nina Effects. 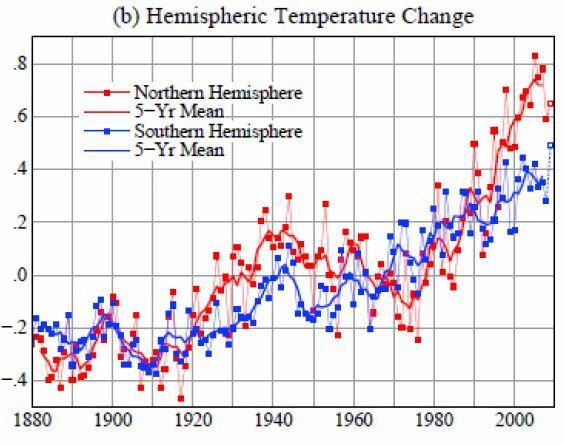 Source: James Hansen: “The Temperature of Science.” Read it here. Exhibit #7. Effects of Volcanic Activity. Source: (Video) “This Year’s Model.” View it here for a full explanation. The orange represents 58 model runs, the red represents the average of those runs, and the black represents actual temperatures. Note the dips following major volcanic eruptions. Exhibit #8. 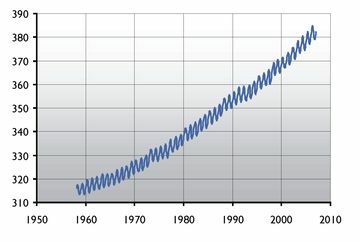 Atmospheric CO2 (parts per million). Source: Wired Science. Read it here. Exhibit #9: Climate Forcings. 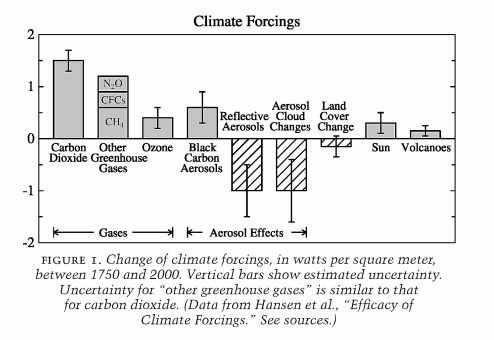 Source: Storms of my Grandchildren, by James Hansen. Bloomsbury, 2009. 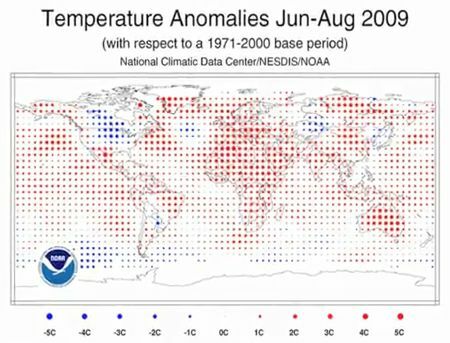 Exhibit #10: Temperature anomalies, June-August 2009. Source: National Climatic Data Center/NESDIS/NOAA. The blue dots represent lower-than-average temperatures for June-August 2009, and the red dots represent higher-than-average temperatures for the same period. (The average is taken from a 1971-2000 base period.) Globally: August was 2nd warmest on record. June-August was third warmest on record. Ocean: August was the warmest on record. June-August was the warmest on record. Southern Hemisphere: Warmest on record. 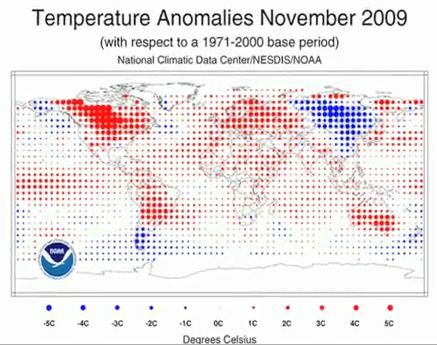 Exhibit #11: Temperature anomalies, November 2009. Source: National Climatic Data Center/NESDIS/NOAA. Compare with the previous chart. A warm summer is followed by a very warm November, including abnormally warm temperatures in North America. 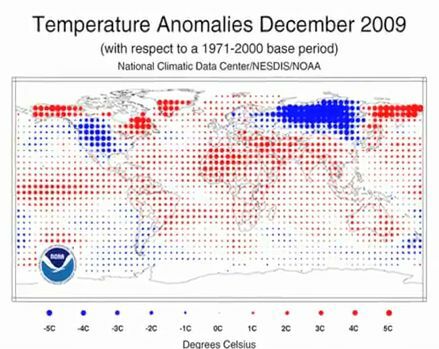 Exhibit #12: Temperature anomalies, December 2009. Source: National Climatic Data Center/NESDIS/NOAA. Compare with previous two charts. Unseasonable warmth in the summer and fall set the stage for dramatic winter weather. The Great Lakes were warmer because of the November weather. Cold air blowing down from the Arctic picked up moisture and dumped it as snow across the mid-West. 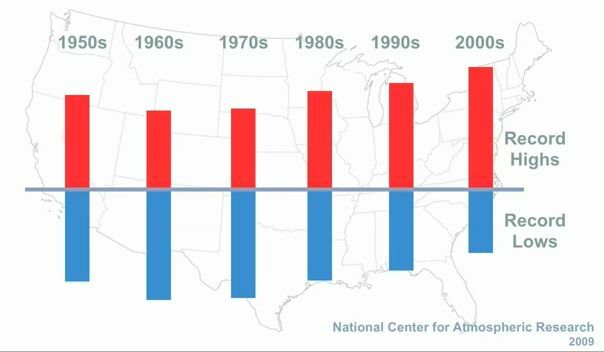 Exhibit #13: Ratio of record highs to record lows, 1950-2010. Source: National Center for Atmospheric Research (NCAR). Gerald Meehl of the NCAR explains: “In the last 10-20 years, there has been this ratio of about 2-to-1. For every two record high maximum temperatures, there has been only one record low minimum temperature set on average over the U.S.” If present trends continue, Meehl continues, this ratio will be about 20-to-1 by 2050, and it will be about 50-to-1 by the end of this century.